I have never had such a tiny little girl. 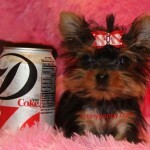 My little Mia is only 1.2 lbs at 16 weeks of age. 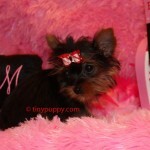 She is as tiny as the valentine card itself. 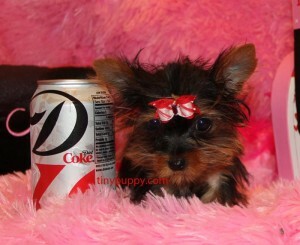 Just think of owning this tiny little baby. 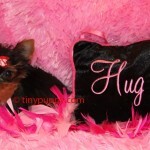 She is going to need a special Mom or Dad that can take care of her every need. Much work has gone into raising this little girl. Many, many hours watching over her tiny body, yet she is so healthy. She is so special to us and we want to find her the perfect home. 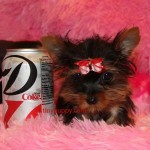 If you are interested in owning a Yorkshire Terrier puppy who will most likely be around 1.5 – 2 lbs please give me a call. She is a doll.